A group of House Republicans is taking another whack at what they call an alternative to Medicaid expansion so uninsured North Carolina residents can obtain health coverage. 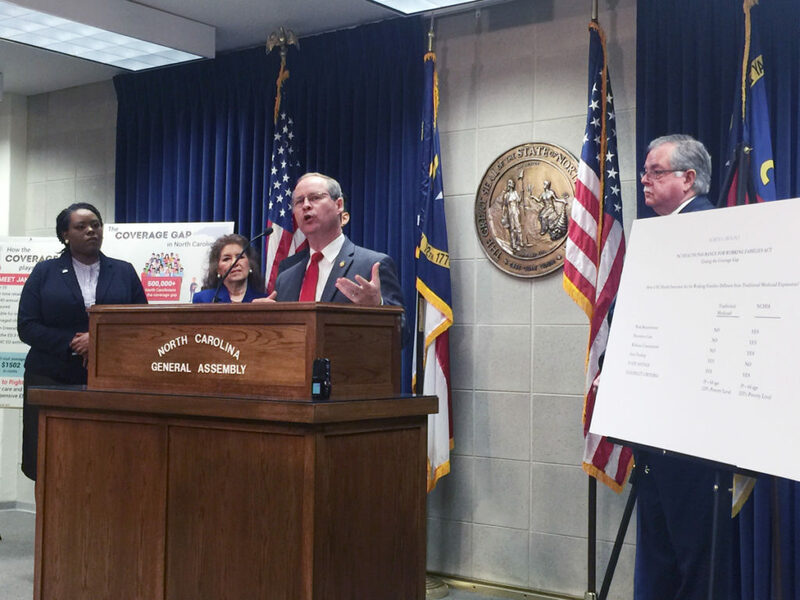 State Reps. Donny Lambeth, R-Forsyth; Josh Dobson, R-McDowell; Greg Murphy, R-Pitt; and Donna McDowell White, R-Johnston, held a news conference Tuesday, April 9, before they introduced House Bill 655, the N.C. Health Insurance for Working Families Act. It mirrors Carolina Cares legislation they proposed in the 2017-18 legislative session. The updated program would cost $4.7 billion and cover 543,000 people. It would launch in July 2020. “It can be viewed as an insurance alternative for working, low-income individuals,” Lambeth said, noting Republicans typically have opposed Medicaid growth. “We haven’t had a chance to take a look at the bill yet, but at first glance it appears to have some of the same problems as Obamacare Medicaid expansion that concern us, namely relying on the federal government to fund 90 percent of it in perpetuity,” said Bill D’Elia, a spokesman for Senate leader Phil Berger, R-Rockingham. Lambeth said Congress would have pass a law changing the funding formula. Under H.B. 655, coverage would terminate if the federal funding share dipped below 90 percent. Bill drafters expect the program would cover 300,000 currently uninsured people; people with certain disabilities; and 200,000 workers who would shift from private insurance or State Health Plan coverage because the premiums, deductibles, and co-payments in H.B. 655 would cost less. The 10 percent state match would come from several sources: hospital fees; $364 million in premium taxes from insurers; premiums from enrollees equaling 2 percent of household income; and unspecified transfers among state agencies. The N.C. Healthcare Association representing hospitals said H.B. 655 is a common-sense proposal. Blue Cross and Blue Shield of North Carolina was more circumspect. Lambeth said the state would save $60 million a year because the 90 percent federal match would offset uncompensated hospital charity care the state now subsidizes. Even if H.B. 655 became law, the state would need a waiver of the state’s Medicaid plan from the federal Centers for Medicare and Medicaid Services. The program would be administered under the Medicaid managed care organizations that are part of statewide Medicaid transformation launching Nov. 1. The state Department of Insurance backed away from the contention H.B. 655 is insurance. Spokesman Barry Smith said Insurance Department officials were aware the bill was going to be filed. But the department doesn’t oversee Medicaid programs, he said, and wouldn’t administer this plan because the state Department of Health and Human Services would implement it. DHHS is responsible for state Medicaid services. On another front, Roberts disputed Lambeth’s contention that North Carolina tax dollars have helped pay for other states to expand Medicaid. Lambeth said a 0.9 percent Social Security tax includes a medical component partially funding Medicaid expansion. That tax helps pay for Medicare, not Medicaid. This year’s legislation includes an $80 million rural health grant program paid with the 1.9 percent premium tax levied on insurers. Communities could use the grants to help hospitals recruit and retain physicians, expand telehealth services, or provide startup funding for new clinical services. North Carolina hospitals and providers have been hit with more than $600 million in federal funding cuts, and about $300 million more in cuts are pending, Lambeth said. He’s been warned this session that three hospitals are fighting for survival. “That story is going to continue to unfold in North Carolina if we don’t do something proactive,” Lambeth said. The bill also includes a work requirement for participants — with some hardship exceptions. The work requirement may pose a legal challenge. In late March, a federal judge threw out Medicaid work requirements in Arkansas and Kentucky. He ruled a work mandate violated the spirit of Medicaid’s mission to provide insurance to the poor.